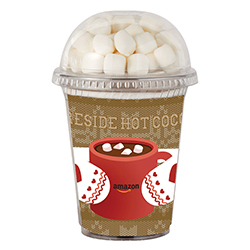 Forever Yours Fireside Hot Chocolate Kit includes: Hot Chocolate Mix (0.8 oz), Mini Marshmallows (1.2 oz), 8 oz. Paper Cup. Makes 1 serving. HCDU-V Forever Yours Fireside Hot Chocolate Kit includes: Hot Chocolate Mix (0.8 oz), Mini Marshmallows (1.2 oz), 8 oz. Paper Cup. Makes 1 serving.